You can expect to do a lot on a cruise, whether it's sightseeing around port cities, feasting and drinking your way around the ship's restaurants and bars, or simply lounging on the sun deck working on your tan. Though you'd be wise to avoid the cruise experience one woman had recently, when she fell off the boat and ended up having to tread water overnight before anyone rescued her. 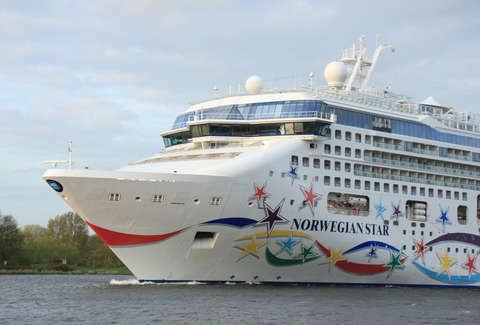 Over the weekend, a British passenger aboard the Norwegian Star in the Adriatic Sea fell from the ship's seventh deck and managed to survive by treading water for a whopping 10 hours before she was miraculously pulled from the frigid depths by the Croatian coastguard. It's still unclear exactly how Kay Longstaff, 46, ended up in the water 60 miles off the coast in the first place, but officials are investigating to find out exactly what sent her overboard. In any case, she lived to tell about her ordeal and has since been released from the hospital in excellent condition. The incident, which occurred around midnight on Saturday, set off a frantic search once crew were notified of her disappearance, and the ship actually turned around and made four different passes by the area where it was believed she fell. Eventually, though, the captain suspended the search around 6am and handed the effort over to the Croatian authorities, who used a spotter plane and boat to continue the search. At 9:45am, they found her, and pulled her from the water. "The crew on board the cruise liner originally had doubts that she would survive but she was picked up alive," a spokesperson for the Croatian ministry of maritime affairs said. "She was waving her arms in the air and calling out when the coastguard first reached her. She was very relived to be saved." Apparently, Longstaff wasn't injured at all, but was in shock and suffering from hypothermia. As for how she was able to endure the prolonged exposure to the open water without a life vest or floating device, she credits her yoga fitness. She also allegedly sang to herself while treading water to not feel cold. According to the Croatian spokesperson, the Norwegian crew knew the exact moment she fell off the boat thanks to CCTV footage. Considering it must have been a traumatic event, Longstaff was still all smiles as she disembarked the rescue vessel en route to the hospital. “I was sitting at the back of the deck and, yeah... it was bad,” Longstaff said before being taken into an ambulance after her rescue, according to The Guardian. The Norwegian Star was making its way from Pula, Croatia to Venice, Italy to wrap up a seven-day Mediterranean cruise, and while the story fortunately has a happy ending, the hours-long delay screwed up some travel plans for a number of fellow passengers who were forced to rebook arrangements.